Teams that win consecutive games by 30 points don’t come around often. When the San Francisco 49ers did just that in Week 5 and Week 6, they became the 16th team to pull off the feat since 1990. Five of the previous 15 teams did exactly what the Niners did in Week 7: lose. The 49ers were vanquished by the New York Giants — the team that’s served as their most notable rival during Jim Harbaugh’s brief reign. The Giants have spent 2012 oscillating between elite quarters or halves and middling ones. The same team that just rolled the 49ers in Candlestick, 26-3, already has losses to the Cowboys and Eagles on their résumé, and it took a miraculous fourth-quarter comeback to keep them from losing at home to the Bucs. Even the most fervent Giants apologist wouldn’t pretend to say that the Giants are consistently great; instead, they would probably argue that the Giants are great when it counts. Oddly enough, in the context of the game, the first quarter ended up being not very real at all. I don’t mean that as some sort of existential comment, but instead in the sense that the first quarter bore virtually no resemblance to the rest of the game. The 49ers utterly dominated the Giants in the first 15 minutes, looking like the team that had just destroyed the Jets and Bills. They marched the ball downfield twice on two long drives, confusing the Giants defense with a variety of personnel groups and inspired play calling. They ran the ball effectively, accruing 48 yards on eight carries by Frank Gore and Kendall Hunter. When they needed to throw, Alex Smith was able to make simple, effective throws from clean pockets to open receivers underneath. Unfortunately, it was their only stretch of sustained effectiveness on the day. After the Niners went 0-for-12 on meaningful third-down attempts in the NFC championship game last year, they started with a 4-for-6 performance on third down during the first quarter. After that first 15 minutes, San Francisco went 0-for-10 on third and fourth downs. When the Giants had the ball, they could only muster two short drives that produced punts. On a bad day for the Giants, they finish the first quarter down 14-0. Instead, they were able to bend without breaking, and when David Akers missed a 43-yard field goal on one of the two drives, the Giants got out of the quarter down 3-0. It should be heartening for 49ers fans to realize that they played so well against tough competition during the first quarter, but they weren’t able to create the early lead that would have made this game a much easier proposition. Akers’s struggles are becoming worth mentioning now. Through six games, he is 11-for-16 on field goals, a success percentage of just 68.8 percent. The only kicker in the league with a job who has been worse is Miami’s Dan Carpenter. Last year, because they were so conservative in the red zone, the 49ers attempted 11 more field goals than anybody else in football, and while Akers’s conversion percentage was about average at 84.6 percent, his volume was such that he earned a trip back to the All-Pro team. There probably isn’t anything wrong with Akers this year, since 16 kicks is a really small sample size, but this is one of the many reasons why it’s a bad idea to be “sure” about what a veteran kicker can do from season to season. Akers has been one of the league’s worst kickers this year, and it’s cost the Niners some opportunities. The former Eagles kicker would go on to miss a second field goal at the end of the first half, a miss that would represent one of San Francisco’s two big chances to regain momentum and turn the game around. San Francisco’s special teams came up with a big play inside of 30 seconds when they blocked Lawrence Tynes’s field-goal attempt. From there, the 49ers brought in Colin Kaepernick to run a 15-second offense, a role that he filled to perfection by hitting Mario Manningham over the middle for a 36-yard gain. Akers missed the ensuing 52-yarder wide left, though, which erased San Francisco’s opportunity to grab an unlikely six-point swing and turn a 13-3 deficit into a 10-6 one at halftime. It’s also interesting to see just how aggressive the Niners have become with using Kaepernick, who has become a regular part of the San Francisco offense. After playing him just one snap over the first three weeks of the season, the 49ers introduced Kaepernick for a few plays in the Week 4 win over the Jets. He followed that by participating on 28 percent of San Francisco’s snaps in last week’s win over the Bills, but that made sense; the Niners had a huge lead and were planning on running the ball anyway, so why not use Kaepernick as a possible option? This week, though, Kaepernick played 26 percent of the snaps and almost exclusively showed up while the game was still a contest. 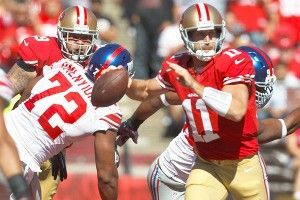 The Niners were comfortable swapping between him and Alex Smith on consecutive plays, even if one quarterback or the other had been significantly impressive on the previous one. When Smith completed a bomb to Randy Moss for 55 yards in the third quarter (his biggest play of the day) the 49ers brought in Kaepernick to play quarterback on the very next play. And then they took him out and brought Smith back in on the play after that. While Kaepernick has a huge arm and is an athlete who’s going to offer teams a lot to think about with the pistol offense, he also lacks the conservative instincts that are built into Smith and the design of the offense. That single play Kaepernick came in for that I mentioned earlier? It produced an 11-yard sack when Kaepernick held onto the ball for too long and tried to scramble his way out of trouble. That pushed back the 49ers and eventually got them stuck in a fourth-and-15 spot on the 34-yard line, at which point the Niners tried to go for it and Smith mysteriously threw a pass to a covered Vernon Davis two yards past the line of scrimmage. Obviously, teams don’t use their backup quarterback the way that the Niners are using Kaepernick, and it will be interesting to see how it affects Smith’s rhythm and confidence as the season goes along. The second play that could have shifted momentum in San Francisco’s favor came in the third quarter, with the Giants up 20-3 and inside the red zone after Antrel Rolle’s first interception of the game. Do you remember how Eddie Royal failed to get across the face of the defensive back on Monday night and created a pick-six for his quarterback? That’s what Victor Cruz failed to do while running a slant versus Carlos Rogers. The result was one of the easiest interceptions Rogers will ever have a shot at, a pass that hit him square in the stomach. With an open sideline in front of him, Rogers might have even had a shot at a pick-six, which would have been an absolute game-changer. Instead, the old Carlos Rogers was on display in Candlestick, as he let the pick bounce harmlessly off him and to the turf. The Giants kicked a field goal two plays later to go up 23-3, and the 49ers never threatened again. Oh, so those three interceptions by Alex Smith are probably worth talking about, right? The first interception serves as a pretty clear break; up to that point, the Niners dominated. Afterward, the Giants were the better team. On the interception, the 49ers tried to get Delanie Walker free up the sideline after motioning him into the interior of the formation before the snap. Smith’s read, as Troy Aikman noted on the television broadcast of the game, was off. Instead of realizing that Mario Manningham was going to become open in the middle of the field, Smith was baited into the throw by a retreating Prince Amukamara, who turned toward Walker as Smith released. He compounded the error by underthrowing the pass, giving Amukamara all the time he needed to undercut the route and grab an easy interception. If Smith’s throw was farther downfield or had more zip on it, it’s more likely the play would have been an incompletion as opposed to a pick. Smith’s other two interceptions came over the middle on picks by Antrel Rolle. In both cases, they were ill-advised throws forced into Smith’s second reads in windows that weren’t there. On the second interception, Corey Webster worked underneath Mario Manningham (who ran a route inspired by Etch A Sketch) and got in Smith’s throwing lane. Smith instead tried to toss the ball over Webster to Manningham, but it was a wildly high throw, so much so that the oncoming Rolle had to lean back and tip it to himself so he could catch up to it and make the pick. And the third pick, which came on the subsequent drive, was a third-and-long in which Michael Crabtree ran a dig (deep in) route near the sticks and Rolle simply drove ahead of the pass. Aikman suggested that Smith simply didn’t account for Rolle when he made the throw, and I don’t see any reason to disagree with him. All told, these were three preventable, disappointing interceptions. Both of those third-quarter interceptions were immediately preceded by penalties, which caused unnecessary problems for the Niners all night. A false start by backup guard Leonard Davis on third-and-1 pushed the Niners back into third-and-6 and changed a likely run into a likely pass on the second interception, while a delay of game on third-and-11 created a desperate third-and-16 for San Francisco on the third and final pick. Those two penalties weren’t the difference between the Niners winning and losing, of course, but they may have just created the context the Giants needed to help make those interceptions happen. Davis’s presence on the field was also disconcerting for Niners fans. He was a dominant run blocker in his heyday at guard with the Cowboys, but he didn’t play in 2011 and is stretched as a pass protector in even a limited role these days. He came on to play right guard after left tackle Joe Staley suffered a concussion, forcing Alex Boone to shift to the blind side and protect Smith and Kaepernick. Staley’s symptoms are fortunately clearing up well, but the Giants didn’t really get any pressure on Smith (one coverage sack aside) until Staley left. The play of Staley, Boone, and left guard Mike Iupati has been Pro Bowl–worthy this season, so losing one of them and moving one to a more difficult position should create problems for the San Francisco running game. Having to insert Davis doesn’t make things any easier. The 49ers did take guard Joe Looney in the fourth round of the 2012 draft, but it’s worth noting that they’ve gotten absolutely nothing out of their top two picks; wideout A.J. Jenkins and halfback LaMichael James haven’t touched the ball once this year while serving as healthy scratches in all but one game. If the 49ers do run into injuries and depth concerns, it’ll be interesting to wonder whether they should have gone after players more likely to contribute to the cause as rookies. After everything, though, the most notable aspect of the game was what the Giants did on their last meaningful drive. The Giants took over with 9:07 left on their own 14-yard line with a 20-point lead and promptly ran the ball down the 49ers’ collective throat. Each of the 12 plays on the drive were runs, and they started with three consecutive carries of 10 yards or more, which obviously all produced first downs. San Francisco has only allowed 12 runs of 10 yards or more this season; seven of them were by the Giants, and four of them were on this drive alone. After allowing Ahmad Bradshaw just 23 yards on 11 carries during the first half, Bradshaw and David Wilson combined for 123 yards on 28 carries during the final 30 minutes. Most of New York’s successful runs came right up the gut — literally, either directly behind the center or in the A-gaps — and involved excellent work by their interior linemen, both on the line of scrimmage and at the second level. They brought back Pro Bowl lineman David Diehl for this game after he sat out four games with a knee injury, but the Giants used him as a sixth lineman on running downs as opposed to giving him a starting job at left guard or right tackle. And while I’m scared to say this, it’s true: The Giants were able to run the ball in part because star inside linebackers Patrick Willis and NaVorro Bowman just didn’t play very well against the run for the 49ers, especially in the fourth quarter. When you watch that quarter on film, you see the usually superb Willis and Bowman getting easily caught up in traffic or sealed off from affecting the play, over and over again. It’s something Matt Millen also noticed when he watched the tape, a move that inspired “You can’t do what I do, media outsider” criticism from Willis before Willis realized that Millen was once an All-Pro linebacker. This one seems more like a bad day at the office than anything else; the Niners could easily have been gassed after all those turnovers and extra possessions, and the Giants did a great job of getting their guards (and fullback Henry Hynoski) to the second level to interfere. Niners fans and Giants fans each have positives and negatives they can take away from this game. For the Giants, the only real negative is how they played during the first quarter; they ran the ball effectively on the league’s best run defense, forced Alex Smith into stupid mistakes, and were both efficient and effective through the air. Niners fans can point to that dominant first quarter and try to forget about everything else. The Giants were the better team on Sunday and deserved to win, even if the final score flattered them a bit. If these two teams played 100 times, though, the margin of victory wouldn’t often be more than a touchdown. In reality, the differences between these two teams more closely resemble the NFC championship game than the blowout we saw on Sunday.